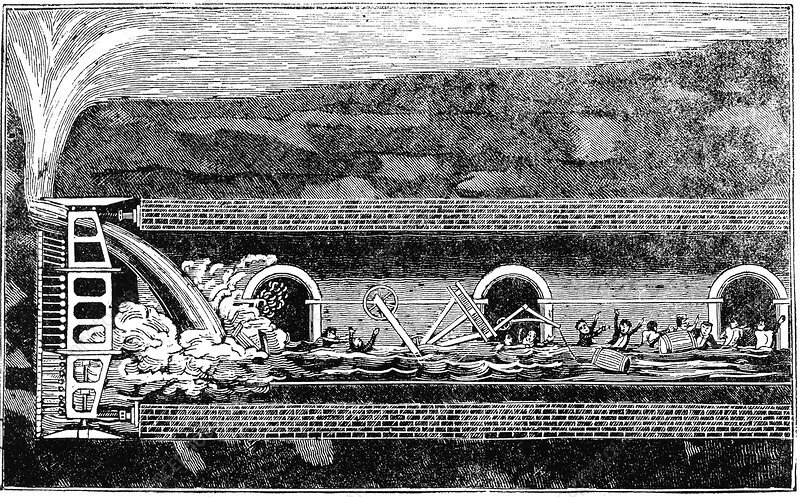 Flooding during the excavation of the Thames Tunnel, London,1828 (1836). On 12 January 1828, water flooded into the workings of Marc Isambard Brunel's tunnel beneath the River Thames. Isambard Kingdom Brunel, the site engineer, was among others in the workings at the time who narrowly escaped with their lives. The accident seriously delayed work on the project, which had begun in 1825. The tunnel, which connected Wapping and Rotherhithe, was finally completed in 1843. It was the world's first underwater tunnel.